Our "Pioneer(s) of the Month" are this time Erin and Martin from Switzerland. Originally Erin is from the US and Martin from Canada. On their journeys they have a tendency to gravitate towards hiking or trekking holidays and appreciate the ability to discover or experience a new place slowly via walking, like in Greenland. 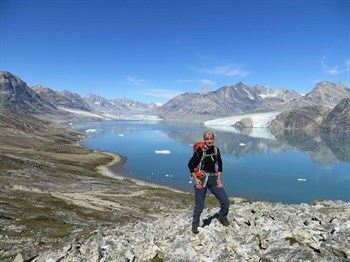 For Martin, as an amateur photographer, it was an tremendous pleasure to capture the beauty of Greenland in his photos! You can find more of his photos on his Flickr Account or Tumblr Blog. What motivated you to visit Greenland? A certain childish yet profound desire to somehow feel like an explorer again, to experience a more remote land where one could hike or trek literally off the beaten path and witness never-before-seen vistas of mountains and ice. 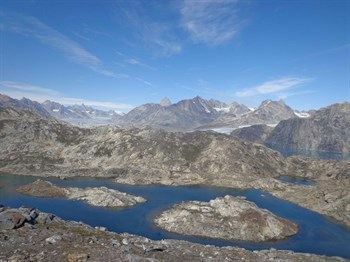 So as avid trekkers with a particular fondness for mountains, Greenland sounded like the ideal destination. And as an amateur photographer with a strong preference for landscapes, it was even harder to resist. We were in Greenland for a total of ten days, and joined a group as part of a tour. We were twelve participants in total, forming a diverse, curious and fun group whose enthusiasm undeniably contributed to the overall experience. The tour we were on was called ‘Icefjord and Remote Villages’. Why did we select this particular trip? In all honesty, we both have a tendency to get cold quite easily, and the prospect of camping in the Arctic still seemed a little daunting at the time. So with this tour promising accommodation in a variety of indoor lodgings, from hostels to hunter’s cabins to local houses, it seemed like the perfect fit for a first taste of the country. The opportunity to visit a few remote villages of the lesser-developed east coast was also part of the appeal for us, as we were curious not only to meet the locals and try and better understand their traditional way of life, but also to learn more about the socio-economic challenges faced by these communities in general. Greenland is still wild. Even at the height of summer, one can easily feel how precarious living in this world of ice can be, or how vulnerable we are to the whims of Mother Nature. Something as simple as a boat transfer between nearby villages can turn into an adventure. This we will never forget. We had four of these transfers in total, and they were all memorable in their own way. One didn’t happen on the day it was supposed to (storm coming), one took a different route than planned (ice jam), one involved an unplanned sighting of a pair of majestic animals (humpback whales), and all required expert navigation by our skillful captains. Indeed, whether we swerved left and right at high speed around giant icebergs, or slowly and painstakingly snaked around them in a maze of ice, it was equally exciting as it was unexpected. What is something that you learned about Greenland that surprised you? That the weather—at least in summer—is much more reasonable and manageable than we had (simplistically) assumed or anticipated. We learned that summers in the east are usually sunny and dry, which came as a pleasant surprise given that we had physically and mentally prepared for the worst (an unwarranted parallel drawn with nearby Iceland perhaps?). We also experienced relatively warm and comfortable temperatures during the day, especially for hiking, which we also gladly welcomed given our initial concerns with the cold. If you had more time in Greenland, what else would you like to see and do? We would probably consider doing the Arctic Circle Trail in the west. This would not only give us a reason to visit the other side, which—as hard as it is to believe—apparently has even larger icebergs than the mammoth ones found in the Icefjord, but also allow us to do more of that wilderness trekking we enjoyed so much on this tour. In any case, no matter which region we visit next, any wildlife spotting would be a treat, from the easier ones to spot like the musk ox or maybe the reindeer, to the more elusive ones like the arctic fox or white-tailed eagle. 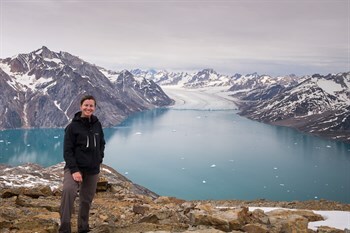 What tips do you have for people who want to visit Greenland? Given that the flight back home inevitably took us through Iceland, it was the perfect opportunity to complete the famous Laugavegur trek there as well (from Landmannalaugar to Þórsmörk), which we did a few days after returning to Reykjavik and thoroughly enjoyed. Then, later this month, we will try and make the most out of the summer season and attempt another classic trek, the grueling 15-day GR20 trail along the mountainous backbone of the French island of Corsica. The outcome of that experience might determine the fate of our current “next dream adventure”: a long-distance backpacking trip such as the John Muir Trail. Ask us again next month maybe! 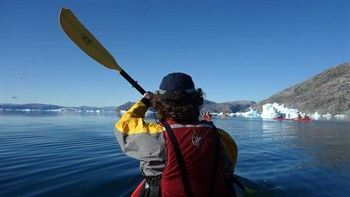 Start planning your unforgettable adventure in Greenland by browsing our tours here. Want to have awesome stories about Greenland like this one delivered to your inbox? Subscribe to our free, monthly newsletter.